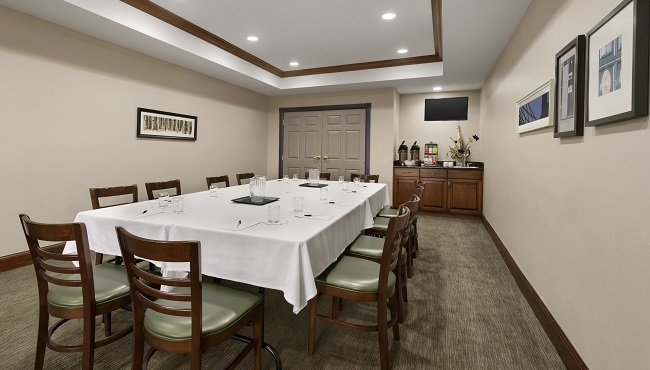 Whether you’re hosting an important business conference or a festive social gathering, the boardroom at the Country Inn & Suites provides a welcoming venue for up to 25 guests. If your gathering requires more space, you can reserve the hotel dining area, which accommodates up to 40 people. Our meeting facilities are ideally located in Little Chute, WI, only five miles from downtown Appleton. We also offer thoughtful amenities like free high-speed Internet access, beverage service and audiovisual equipment. If you have attendees coming from out of town, share important details and directions with them using a personalized Web page designed specifically for your meeting. If you need to host an event for more than 40 people, our hotel lies across the street from a full-service restaurant with banquet facilities. Group accommodations are available at the hotel.